Third-grade students at Northgate Crossing Elementary School had the special opportunity to receive their very own dictionary on Friday, thanks to the vision of The Dictionary Project. The charitable organization promotes literacy to children in the third grade as they transition from learning how to read to identifying and using information. "We started this project in 1995 and it was the brainchild of Annie Plummer, who started the program down in Savannah, Georgia," said Mary French, founder and executive director of The Dictionary Project. "Her opportunities were limited because of her inability to read. As a cleaning lady, she bought dictionaries for all of the students at the school within her community." According to the mission statement of the program, The Dictionary Project aims to assist all students in becoming good writers, active readers, creative thinkers, and resourceful learners by providing them with their own personal dictionary. The dictionaries are gifted specifically to third-graders for use at school and at home for years to come. "[Plummer] noticed that the children were crossing from school to go home and didn't have any books in their hands," said French. "She asked, 'Why don't you have any books?' That's what gave her the idea that they should at least have a dictionary at home so they could learn those words." The Dictionary Project has been adopted and refined by individuals, businesses, civic organizations and volunteers all over the country, including the Houston area. 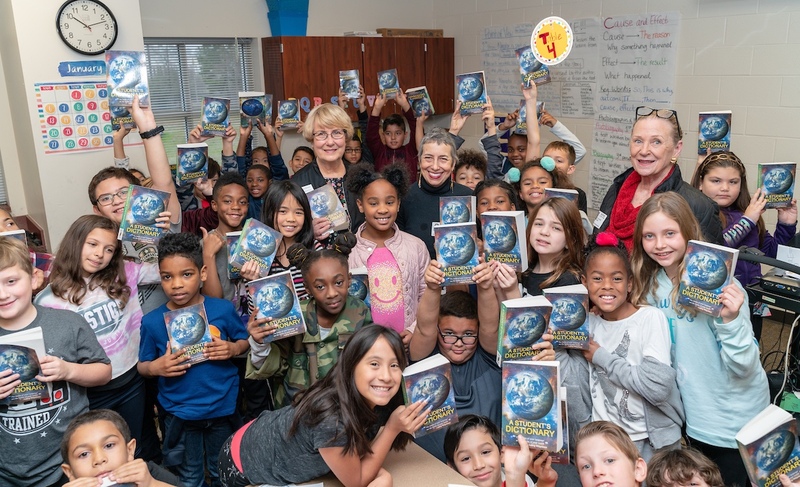 So far this school year, students across 15 of Spring ISD's elementary schools have received dictionaries, thanks to Northwest Forest Republican Women and donations from members and friends in the community. Every third-grader in the district will have received a dictionary before the end of the school year. Principal Kristi Brown says Northgate Crossing has participated in the project for as long as the school itself has been open - over ten years. "This program allows each one of our kids to have a dictionary with them all day long that they can use - even beyond reading - in the content areas, such as science," said Brown. "For instance, science has very difficult vocabulary, and a lot of times, kids can't make a connection with it. But they can look up a word in the dictionary, read what the definition is, and see a sample sentence and make connections to it. It brings meaning to whatever content they are learning." French says she wants third-graders at Northgate Crossing to take away the importance of learning and understand that it is a lifelong process. "Our volunteers visiting Northgate understand the value of learning just like Anne Plummer did," French said. "No matter what level you're on, you should understand the importance of learning."